Greenville Avenue in Dallas is best known for its ample supply of happy hour specials and late night shots (some liquor some not). 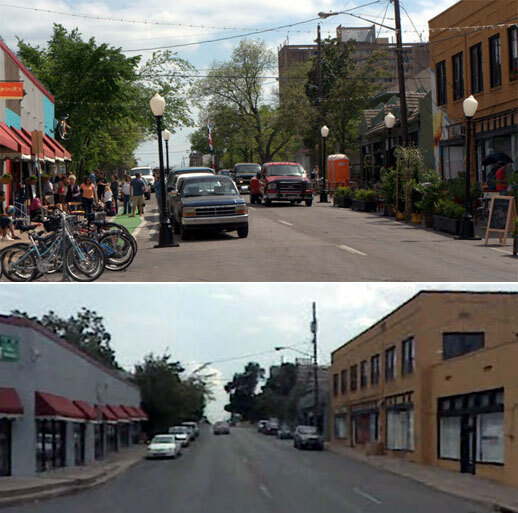 Change is on the way for this main street in Dallas according to councilperson Angela Hunt at a recent press conference. Greenville Avenue has been on the city radar in the past for transportation improvements. Former Dallas City Manager Ted Benavides recalls the history of how Greenville Avenue was removed from the city’s thoroughfare plan. The thoroughfare plan designates roads based on the national functional classification system of Arterial (big road, typically 6 lanes), Collector (medium road, typically 4 lanes) and Local (small road, 2 lanes). Greenville was removed from the thoroughfare plan from Mockingbird to Ross Avenue. But why? Benevides recalls that the city was weary from years of US 75 construction in the late nineties ad the M streets neighborhood was feeling the effects of cut-through traffic, so the City of Dallas contracted with traffic engineers Kimley-Horn and Associates to solve the “congestion issue”. The recommendation: convert Greenville from Mockingbird to Ross Ave into a one-way pair with the parallel street Matilda. A logical answer for the traffic engineer. Logic says if the pipe is overloaded dig another pipe next to it. When this “solution” was revealed to the neighborhood the reaction as you guessed was negative. So negative that the neighborhood demanded the Collector designation be removed from Greenville and the city stay out of their affairs. As a local street, Greenville has missed out on funding opportunities for improvements and local maintenance has been sparse. Angela Hunt is focused on making Greenville back into a main street and she is doing it with local support. You might even say she is following her constituents. Directing precious city funds towards projects that will have an immediate community and economic impact is exactly what this city needs. That and food trailers! Oh and Greenville might end-up back on the Thoroughfare Plan. If that thoroughfare plan respects complete streets and greater public streetspace. The consultant proposals for the Dallas Complete Street Initiative went in today. The City should be making a selection prior to the end of the year. Each one of us wants to be able to bring a part of town to life, a Greenville, a Tyler Street, a Malcolm X @MLK…it can happen if we only are allowed to.